Cut loose from the red tape and restrictions that can sometimes come with being on a record label, this is mewithoutYou's first full-length album released independently of Tooth & Nail. It's also their first batch of original material since 2009's "It's All Crazy! It's All False! It's All A Dream! It's Alright", which ditched all the usual stylings and turned a quirkier corner. The psychedelic/folksy vibe coupled with a bombardment of lyrical shout-outs to whimsically named foods tipped just over the edge of eccentricity, turning some fans off (and others on, as curveball albums tend to do). It's a wonderfully creative release, sure, but it lacks the consistently unhinged, gut-wrenching cycle of self loathing and exploration that made earlier albums like "[A-->B] Life" so significant for so many. That being said, mewithoutYou have certainly never been at a loss for creativity or imagination. There has always been an abundance of both in each of their releases and an equal measure of passion to support them, it's just a matter of how they are expressed. For whatever reason, "Ten Stories" makes a return to their previous assemblage of sound - thickset guitars, emotionally heavy bridges and abrading vocals - without compromising their own development. 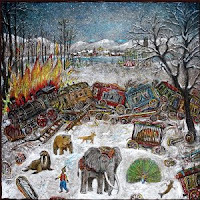 Structurally and stylistically, "Ten Stories" journeys through familiar mewithoutYou territory, but at the same time it is unlike any of their former releases. If comparisons had to be made the closest would be "Brother, Sister", primarily in that they share the same sense of fluidity and absolution, but "Ten Stories" feels as though it's riding on a fresh wind and for any longtime fan the first few bars of opening track "February, 1878" will feel like witnessing the resurrection of something that has been buried for six years. The distortion-heavy chord progressions and distant shivering of tambourine zils will erect hairs on your body you didn't even know existed. Then the drums kick in along with frontman Aaron Weiss' vocals - that unique delivery that jumps between spoken word and broken cries - and you know you probably aren't prepared for what's about to go down. The most outstanding feature that sets "Ten Stories" apart from any of their previous albums is the lyrical approach. Although thematically a lot of the same concepts arise - faith, doubt, desire, restraint, reality and truth or lack thereof, death etc - Weiss veers away from the autobiographical and instead uses different characters to present conflicting views. The focus is less on shouting about the dark or depressing and more about exploring the conceptual without the necessary need for resolution, and that is probably the main reason why "Ten Stories" feels so different. Something has shifted. Musically the tone may occupy a similar shadowy and hypnotic state to "Brother, Sister", but the playful nature of the lyrics add a sense of lightness that leaks into every dimly-lit corner. It's heavy, but less crushing. In asking questions, Weiss accepts that it's also okay to not get any answers. By simultaneously spinning stories into autobiography and weaving between perspectives, he takes on the role of lyricist, poet, and storyteller, and the result is a set of songs which play through like a series of Aesop's Fables - turning to nature, particularly animals, to explore existential themes in the same way that Aesop, Yann Martel, or even Hemingway have done. 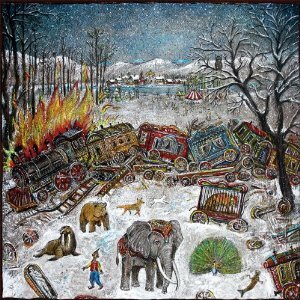 The premise of "Ten Stories" - a circus train crashes in 19th century Montana leaving a menagerie of animals disbanded, lost, and confused - allows mewithoutYou to explore weighty ideas through a light hearted format, using the animals as, essentially, narrators. It takes their use of the metaphorical to a whole new level, but also displaces the potential self-indulgence that could have hung around an album so concentrated on death and loss. Perhaps that would explain why on "Fiji Mermaid" the lyrics "You'll miss having someone to blame for your sadness now" are almost directly followed by an unexpected bread related pun ("maybe there will be a bakery hiring, we'll knead a little bit of dough to get by"). Who knows. That is a rare moment of undisguised joviality on "Ten Stories", though. It's not all jokes about baking and musings on growing asparagus. The first three tracks flow in a continuous vein of volatility and murkiness, "Nine Stories" gradually slides into the distressed repetition of "I wake up disappointed every time" and "Jacob knows a ladder you can climb" and drips with tangible grief, and with its mournful horns and return of a more tender vocal approach, "Bear's Vision of St. Agnes" toes a line between the beautiful and tragic. These are the emotional cornerstones of "Ten Stories", but the more upbeat tracks like "Cardiff Giant" and "Aubergine" provide a necessary pause for breath even if they aren't as hard hitting. They're not unlike the acoustic "Spider" tracks on "Brother, Sister" in that sense, except here the arrangements are more rounded - still delicate and subtle, but more in the vein of "It's All Crazy!…". They work well within the tone and framework of "Ten Stories" as stand alone tracks rather than just interludes. Swinging between dark and light - often beginning with quiet dolefulness and escalating into anguish or launching straight into the latter, "Ten Stories" is wrapped up in a state of constant turbulence that whirls to a dizzying climax with closer "All Circles". And sure, why not have an appearance from Hayley Williams of Paramore on the replies? The two actually compliment each other better than you would think, and in a clamor of overlapping vocals they turn the final page of "Ten Stories" and close the cover on another remarkable addition to mewithoutYou's catalog. "Ten Stories" is out May 15th through Pine Street Records.